In the fall of 2002, when Jill Brown was pregnant with her first child, she saw a TV documentary that focused on children whose faces were marred by tumors. She wasn’t spooked. She thought to herself, “If that’s my child, I’ll be able to handle it.” She was 25, an energetic former college-soccer player with great reserves of patience. A previous pregnancy had ended in a miscarriage, and she was anxious for a better outcome this time. 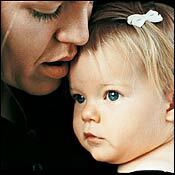 When, on February 16, 2003, she gave birth to a healthy girl weighing seven pounds, thirteen ounces, Jill was overjoyed. The baby was beautiful and feisty. Jill and her husband, Paul, who worked at John Deere Credit in Johnston, Iowa, a suburb of Des Moines, named her Aslynn, a variation on the name of the godly beast in The Lion, the Witch and the Wardrobe. “We could tell she was going to tackle life in her own way,” Jill says. About a week after bringing Aslynn home, Jill spotted a pale-red patch on one side of the baby’s head. She wondered if it was a rash from cradle cap. At Aslynn’s two-week pediatric checkup, Jill asked the doctor if she should put lotion on the skin. The pediatrician told her it was a birthmark, that it would go away before too long, and that its location was fortunate—soon it would be covered with hair. A few weeks later, Aslynn’s extended family gathered for her baptism. By this point, the birthmark had turned a deep shade of cranberry, and it was blistered and swollen. The change had been gradual, and Jill, who was with Aslynn virtually around the clock, had barely noticed the difference. She did, however, note the startled reaction of her relatives, and she asked her doctor for a referral to a pediatric dermatologist. “That was when we started down the wrong path,” Jill says. The dermatologist told the Browns that the birthmark was a hemangioma, a noncancerous tumor composed of a clump of blood vessels run amok. “The doctor said there was nothing to be done about it, and nothing to worry about. He said it should go away by itself by the time Aslynn was 8 or 9, and we’d just have to live with it.” For Jill, who had feared the worst—cancer or brain damage—the diagnosis was reassuring. She trusted the authority of doctors. 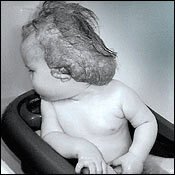 At 4 months, however, the hemangioma had spread to Aslynn’s neck and begun to form a thick, softball-sized mass. Jill also noticed swelling in Aslynn’s throat and on her tongue. Scabs appeared on her head, and left scars when they fell off. Aslynn would tug repeatedly at her left ear, which was now bent from the weight of the growth. The skin between the ear and scalp was cracked, and often bled. Jill prevailed on her pediatrician to schedule an MRI, and when it showed normal brain function, Jill was again relieved. Others were not. Aslynn’s appearance elicited a stream of comments from strangers. Jill considered many of the comments innocent, even charming—children asking why Aslynn’s head was so large, or why it had been painted red—but other remarks were wounding. In the public library, a 10-year-old boy circled Aslynn before shouting at Jill, “That’s the most disgusting thing I’ve ever seen. I’m getting out of here before I’m sick.” At Gymboree class, another mother approached Jill in tears and said that Aslynn’s presence had “traumatized” her. Okay, Jill thought, I’ve exhausted my options. I’ve done testing and seen the best specialists. It’s time to move on. As long as Aslynn is healthy, it doesn’t matter how she looks. In December, Aslynn’s pediatrician detected a heart murmur. Again, nothing to worry about, Jill was told, but worth a trip to the cardiologist. A battery of tests followed. The results were peculiar. Aslynn’s heart had grown enlarged from pumping out a higher-than-normal volume of blood to “feed” the tumor. But the blood, and its nutrients, were being siphoned off by the mass. As a result, Aslynn’s physical development had ground to a halt—she had gained barely one pound in the previous four months—and her heart had been strained to its limits by the tumor’s demands. The diagnosis: high-output cardiac failure. Aslynn was immediately put on two powerful medications. She would have to remain on them, Jill was told, until the hemangioma went away of its own accord. It could be eight years, ten years, twelve—if Aslynn lived that long. Milton Waner is a slight, scholarly-looking man of 50 whose wanderings have taken him from South Africa to Australia to Arkansas to the Upper East Side of Manhattan, where, on April 28, in Operating Room 11 on the neurosurgery ward of Beth Israel Medical Center, he peered down at the inflamed mass on Aslynn Brown’s head. Waner, the object of a year’s wooing by Beth Israel, had moved to New York two weeks earlier (he was still living in an extended-stay hotel) with the intention of pushing his vanguard work on vascular lesions to an even higher level. In New York, he could collaborate with some of the world’s leading researchers and specialists, experts in neurosurgery, radiology, and orthopedics, people he described as doing “space-age” work. As for Aslynn Brown’s parents, they had come to the city for the most elemental of reasons: to save their daughter’s life. The Browns had never before been to New York. The previous day, at Waner’s urging, they had taken Aslynn to Central Park, and for a ride on the subway. They had glimpsed the Statue of Liberty and toured ground zero. Aslynn was delighted by the sights and sounds of the city. Passersby paused to greet her, and she beamed. No one had remarked on her appearance. Now she lay on a steel table in the eerie stillness of anesthesia, wearing only a diaper, her 29-inch, 19-pound body covered to the chest in a sheet of plastic and a warming blanket. A clip on her big toe ran to a computer that monitored her vital signs. One thigh bore a patch that connected her to an electrical ground. Her head was partly shaved, and the skin surrounding her tumor was painted with a rust-colored anti-microbial paste. A ventilator tube ran down her throat. Waner and his entourage—a surgical assistant, a technologist in charge of the instrument tray, an anesthesiologist, and a nurse directing the flow in the room—hovered over Aslynn. She looked perfectly serene. Above all, “the problem is how to cut through the patient and not have her bleed to death as a result,” Warner says. Aslynn’s hemangioma had developed an artery whose purpose was to shunt blood from her heart to the tumor. The artery was as thick as a straw, and was feeding the tumor half of her blood supply. It bulged from the base of her neck. “She would be in a lot of trouble if I made a hole in that vessel,” Waner says. Waner is far and away the world’s leading expert in the treatment of vascular anomalies. He has pioneered groundbreaking methods that have provided safe surgical treatment for patients with all manner of deforming, and often life-threatening, problems, and he has operated on more than 4,000 such cases—far more than any other surgeon. To hear Waner tell it, he didn’t set out to revolutionize the field of vascular anomalies. He simply happened upon a problem that had confounded medicine for years, gave the matter some probing thought, and went about finding new solutions. Waner was born in Brakpan, South Africa, a small town near Johannesburg. His father, who immigrated to South Africa from Lithuania as a child and had little formal education, worked as a tailor, and gradually became a prosperous men’s clothier. Waner’s mother, a Greek Jew whose family fled the Nazis, landed in South Africa via Egypt and the Belgian Congo. Waner trained as a surgeon at the University of Witwatersrand, and specialized in head and neck cancers. In 1985, after being posted to Namibia for compulsory military service—an experience he found “loathsome”—he began to research the use of lasers in cancer treatment. A year later, during a research stint in Australia, he helped to develop one of the first lasers that was capable of “selective destruction”—it emitted just enough energy to cook the targeted tissue without damaging surrounding, healthy areas. The laser turned out to be ideal for treating birthmarks like port-wine stains, which are caused by an abnormal pooling of blood beneath the skin. Soon Waner was restoring long-suffering patients to an unblemished state. Word spread, and before long, Waner was being sent patients with more severe vascular lesions, like hemangiomas. Although vascular anomalies are not rare—in the U.S., 40,000 infants are referred to specialists each year for examination of a range of abnormal birthmarks—the dominant protocol for treating hemangiomas has long been benign neglect. Waner knew that operating on such children, against the advice of the medical establishment, was risky. “I was going out of line,” he says. 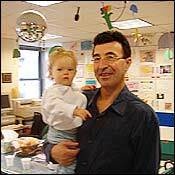 “But clearly the way we were approaching these children was wrong, and something had to be done.” He had discovered that, contrary to orthodox belief, severe hemangiomas rarely healed completely without intervention. Rather, they often left behind damaged skin that had to be surgically repaired, and organs whose functions had been impaired by pressure from the tumor. In extreme cases, like Aslynn’s, the tumors could be life-threatening. Waner was also keenly aware of the psychological trauma suffered by disfigured children. “The world is a cruel place for these children,” he says. As Waner found, “There was no manual to show you how to do these surgeries. It was completely uncharted territory. I had to improvise as I went.” Waner brought a unique blend of assets to the task. He had cut his surgical teeth on cancerous tumors, but unlike most tumor specialists, he also had extensive experience with the techniques of plastic surgery. While other surgeons would typically try simply to cut a hemangioma off the skin, producing large areas of skin loss and requiring extensive reconstructive surgery, Waner had developed a method for folding back the skin, working the tumor out from underneath, and tailoring the remaining skin so that scarring was barely noticeable. He also found ways to stanch the severe blood loss. His primary tools were cauterizing devices that plugged blood vessels as he cut. He also enlisted radiologists to plug blood vessels in order to harden the tumors before excision. For Beth Israel, luring Waner to New York to join Berenstein was akin to bringing A-Rod to the Yankees to pair with Jeter. The hospital promised Waner it would create a program around him—the Vascular and Birthmarks Institute of New York—and place significant research tools at his disposal. Waner couldn’t resist the chance to work with Berenstein and his colleagues. He served notice to Arkansas that he would wind down his practice and head to New York in the spring. A few days before Christmas last year, he received an e-mail containing photos of Aslynn Brown. Waner opened the perimeter of Aslynn’s tumor with exacting slowness. He made a nick of an incision. Blood poured from the opening. He asked for an electrocautery device—a pencil-like instrument that transmits electricity from its nib—and touched it to the end of a blood vessel to stanch the bleeding. Waner repeated this pattern—cut and cauterize, cut and cauterize—dozens of times, until the skin lay across the tumor like a snug flap. A burning smell rose from the incision, along with wisps of smoke. Waner lifted an edge of skin and moved beneath. He was following the precise technique he had developed for removing hemangiomas that others dared not treat: Attack the tumor from beneath the skin, leaving the skin itself intact, all the while plugging the sites of the relentless bleeding. He began looking for a “plane”—a gap between the skin and the tumor that would allow him room to begin cutting off the tumor’s blood vessels. He inched deeper. Rather than a clear plane, though, he found only the equivalent of a murky path through thick brambles. The hemangioma adhered to the underside of the skin. Clumps of blood vessels blocked his way. “When you’re in the wrong plane, it bleeds like there’s no tomorrow,” he says. “You can’t see any separation between normal tissue and the hemangioma. It’s frightening.” Again and again, Waner paused to measure the thickness of the skin flap, to ensure that he remained in the barely discernible opening between skin and tumor. Eventually he reached the top of the hemangioma. A few moments later, he found what he was looking for: a lane beneath the skin with room to maneuver. “As long as you’re not saying ‘Oops,’ ” his assistant replied. Music played from a boom box attached to Waner’s iPod. Classic rock: Eric Clapton, the Beatles, the Stones. Occasionally Waner sang along, but his voice barely rose above a murmur. Having found the plane, Waner was now in control. He moved along the top of the hemangioma, making small brushstroke-like motions with the electrocautery device, cutting through the tumor. He was in a state of rapt attention, oblivious to the presence of others in the room, oblivious to the passage of time or to hunger or fatigue. He knew his luck would run out soon, that his progress would be halted by the feeder artery that was buried in the mass. He could tell he was close to it. His assistant held back the skin flap with a two-pronged retractor. He made tiny stabs at the tissue. Then, abruptly, he froze. He had glimpsed the artery tunneling through the tumor. He called for a pair of fine forceps, and sliced tissue away from the artery on one side, then the other, picking away at the tumor until he found daylight beneath the artery. He maneuvered a clamp beneath it and shut down the supply line that was fueling Aslynn’s tumor and destroying her heart. Waner had turned a corner. He was about three-quarters of the way through the eight-hour surgery, but the greatest danger had been conquered, and he could see his way toward the end. He continued to undermine the tumor, at times using a scalpel whose blade was heated to 350 degrees—perfect for simultaneous cutting and clotting. When the threads that had connected the hemangioma to healthy tissue had all been severed, he gingerly scooped the mass out in a single piece. He gazed at it with some bemusement. It was, he thought, the size of a giant South African mango. Now, with the tumor gone, he went about the task of trimming and molding Aslynn’s stretched skin. He worked like a sculptor, making tidy folds and creases, discarding excess material, building a scar that would flow naturally along the contours of her skull. He began knitting seemingly endless loops of sutures. He worked Aslynn’s bent ear back into shape. For the first time in nearly a year, her head tapered smoothly to her neck. The distended skin was gone. The incision was closed with a tidy seam. The surgery had been “backbreaking,” Waner conceded. Then he stood back to examine his handiwork. “Lovely,” he said. The Browns returned to Iowa five days after the surgery. The next week, at Aslynn’s 15-month pediatric checkup, her heart murmur was barely detectable. Today, she has begun tapering off her heart medications and is gaining weight. “Aslynn has really come alive,” Jill says. “She climbs all over furniture and dances up a storm.” Hair has quickly grown over her incision, and she betrays no awareness of having had surgery. Unless something unexpected happens, she won’t need any more. Sometimes Jill forgets that the hemangioma is gone. When she lays Aslynn down to sleep, she finds herself surprised to feel the hardness of Aslynn’s scalp. For the first time, she can fasten the buttons of Aslynn’s shirts around her neck. She and Paul are still adjusting to life as parents of a healthy baby. On trips out of the house, Jill is taken aback by how little attention Aslynn attracts. “We haven’t heard one negative word since we came home,” she says. Jill has a habit, she says, “of elevating Dr. Waner to the status of God,” but Waner doesn’t like to hear such talk. “I grew up with low self-esteem,” he says. “I’m uncomfortable with adulation.” Still, some facts speak for themselves: No patient of Waner’s has ever died during surgery, and as far as he knows, none of his thousands of patients with vascular abnormalities has ever failed to benefit from treatment.